This classic railway poster artwork shows off one of Claude Buckle’s best know paintings. 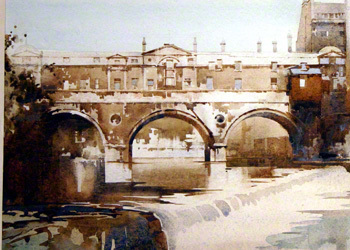 The stonework representation with the weir in front makes for a very appealing image and is an architectural water colour painting of very high standard. This picture shows the original artwork of the poster which is kept at the NRM in York. See the poster page for an image of the actual poster. Created in 1950. This picture shows in part the proposal for the railway poster artwork above. (Courtesy Victoria Art Gallery Bath.) In fact the artists were often in competition with each other and the publicity officers invited proposals from leading artists all the time and worked in collaboration with them.